Finally! A plasma TV manufacturer has attacked the 46" size product category. It's about time as this is a very popular size and LCD TV manufacturers have been dominating it. The TH-46PZ85U is a 3rd level product in Panasonic's lineup for 2008. There are two premium models with more features in the PZ800U series and the PZ850U series products. We'll leave the upgrade commentaries for another article. Still, even as a 3rd level offering this plasma television is packed with some strong features, especially in the picture category. The plasma is the brightest I've ever experienced and with the anti glare technology present in this plasma it is a true competitor to the best LCDs even in a bright light environment. This is one of the main improvements that Panasonic has infused this plasma with. Before turning it on I never dreamed we would see a plasma this bright. HQV Benchmark Picture Testing: The TH-46PZ85U tested very well for most categories. The Video Resolution Loss test and the Diagonal Filter Jaggies Test both showed excellent processing with 1080i signals. Side to side motion testing was extremely smooth and some of the best we’ve seen. One drawback of the Panasonic was a great deal of background noise and dithering in the HD Noise Test. The TH-46PZ85U did not test well in the film resolution loss test. Blue tones in The Fifth Element Blu Ray really popped. 720p/1080i/1080p High Definition Picture Quality: This latest Panasonic plasma is the brightest plasma TV we have ever reviewed. The resultant color rendition is more saturated than previous Panasonic models tested. Blue tones in the Blu Ray DVD version of The Fifth Element really popped (more like an LCD than a plasma picture). Excessive brightness of this plasma makes HD programming really stand out but hurts the realism of the picture images - especially non-computer animated film content. The extra brightness of the TH-46PZ85U will be a benefit to rooms with high ambient light conditions, but a drawback for the darker home theater room. The high brightness of the TV caused some washed out flesh tones. Up conversion/Video Processing from 480i and 480p: Up conversion sometimes poses the biggest problems for today’s plasma and LCD televisions, since all the stores show HD programming on the TVs. I was pleased to find that Panasonic did not neglect this critical area with the TH-46PZ85U. The color rendition with a 480i signal was very bright with fairly accurate flesh tones. Notice the slightly washed out flesh tones of Sienna Miller as Edie Sedgewich in Factory Girl. Also, there was a fair amount of background grain in the Panasonic picture during this recent Blockbuster DVD release. Overall though up conversion video processing was very solid. Black Level/Contrast: The TH-46PZ85U excelled in this area. Panasonic continues to wow with deep natural looking black levels. The black bars displayed top and bottom of the picture are a true black and disappear completely when dark or black content is displayed. Dark Shadow Detail: With a 480i signal the Panasonic TH-46PZ85U clearly stood out as excellent. Dark scenes in Factory Girl showed excellent dark matter detail in clothing, corners, closets and the like. There is enormous range in the gray scale of this plasma. Color Rendition/Color Accuracy: As mentioned a couple of times, the Th-46PZ85U produces very bright colors. The brightness of the plasma washes out the color at times. This brightness will be a plus in a brightly lit room and will create some slightly unrealistic tones in darker environments. Viewing Angle/Off Axis Viewing: The Panasonic TH-46PZ85U was perfect in this are to about 170 degrees. Motion Lag: As with most plasma TVs there was no motion lag present in the TH-46PZ85U. False Contouring/ Mapping: During the Stadium Seating test in the HQV Benchmark Test we did not note any banding or mapping present in the TH-46PZ85U – a standout performance. Screen Glare: Panasonic has implemented useful new anti glare screen technology into most of their 2008 lineup of plasma TVs. The anti-reflective filter helps a lot without dampening the contrast. Exceptions: The TH46-PZ85U ran quietly, emitted little heat, and was easy to set up. Aspect Ratio Sizing Considerations: The Panasonic TH-46PZ85U has 4 aspect ratio adjustments controlled by remote control button Format, Zoom, Just, 4:3, Full. The plasma did a good job with natural algorithmic sizing of the images from a 16:9 DVD. There was some very slight vertical stretching present on the Just mode. Inputs: The TH-46PZ85U has 3 HDMI inputs (one on the side), SD card slot (for pictures) and a 15 pin VGA. There is no USB port or headphone output. Aesthetic Considerations: The 46PZ85U has a high gloss black frame and stand with hidden bottom speaker. The plasma housing feels a little plasticy next to some of the higher end models on the market. However that incredible slim line of just over 3" in depth makes up for a lot. The hidden speaker also allows the plasma some clean lines. The stand is attractive with a small footprint. Remote Control: The TH-46PZ85U remote control is efficient and has some of the essentials like a dedicated aspect ratio control button. However, it is not backlit nor does it have any "cool" features. Menu functionality: The Th-46PZ85U has discrete picture settings for each input – a very important feature since proper picture setting calibrations will be different for different inputs. The user interface is simple and straightforward with limited the limited standard adjustments normally found. There are preset picture settings available, but use our calibrations through the user option. Audio Output: The TH-46PZ85U has full, rich sound quality with good bass from the 10W X 10W built in speakers. The virtual surround effect is excellent. I was very impressed with the speaker quality on the Panasonic from HDMI source signals. The Panasonic TH-46PZ85U is new territory for plasma tvs as Panasonic is the first company since Sampo in 2003 to produce this size. With a retailer price of around $1799 there appears to be a slight premium there. The plasma is priced slightly less than a 2rd level 46" Samsung LCD TV which costs around $1999. And the 46" plasma will save you around $400 off the TH-50PZ85U. Samsung's 3rd level 46" LCD TV sells for around $1699 so just $100 less. 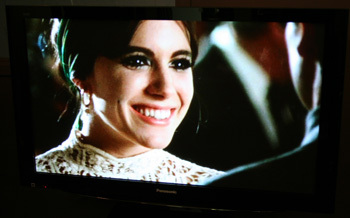 A good plasma TV picture will normally outshine a good LCD TV picture any day – especially a bright one like this one.